The California Department of Fish and Game (DFG) recently released an updated Guide to the Central California Marine Protected Areas. The guide is available online. 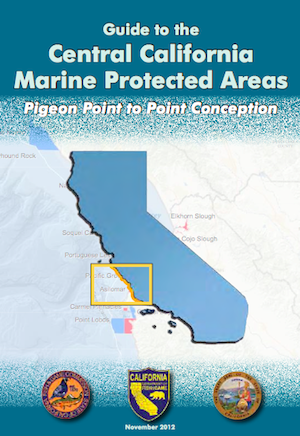 This full-color guide now includes enhanced maps with identifiable landmarks, shoreline boundary images and existing regulations for marine protected areas (MPAs) along the central California coast (Pigeon Point in San Mateo County to Point Conception in Santa Barbara County). Additional information about central California MPAs, answers to frequently asked questions, general rules that apply to all MPAs and links to DFG web pages are also included in the updated guide. “The public has asked us for assistance in identifying local MPA boundaries on-site and that is just what this enhanced guide provides,” said Paul Hamdorf, Acting DFG Marine Region Manager. Central California MPAs went into effect on September 22, 2007 after the California Fish and Game Commission adopted regulations earlier that year. This regional network includes 28 MPAs and one State Marine Recreational Management Area,covering approximately 204 square miles of state waters, or 18 percent of the region. The guide is available for viewing and printing at www.dfg.ca.gov/mlpa/guidebooks.asp. For more information on California’s MPA network, including the central California coast, go to www.dfg.ca.gov/mlpa. Alaska Halibut Bycatch Reduction Measures | You Can Help!